Basically it is funding at its most basic level for most things related to fitness and sports. You can be eligible for financial aid for things like health club memberships, a league fee for a sport, personal trainers, youth camps and a variety of other activities. The Personal Health Investment Today Act has its eyes set on improving the future both through educating children in the importance of fitness and having them engage in it. This is, also helping to hinder the obesity epidemic in our nation. Large organizations and companies involved in this industry see the importance as well and are supporting the movement in big ways. Organizations have come together in different levels of involvement and investment to support the PHIT Act. Companies like Nike, Adidas, Reebok, Everlast, and many more can be found on their supporter’s page here. 48% of all of U.S. high schools do not have PE programs, not because of the lack of funding but they do not exist in these schools. Around 68% of Americans are either overweight or obese, not to mention that in 2014, 87 million Americans were completely inactive. This means less money going into physical education programs, gyms, training, sport leagues, and just about everything the PHIT Act would help fund. It is a real problem that most people should care about, and if we do not support teaching our youth about this importance, then this problem will never be solved. So regardless if you have a child in school or work for a huge fitness corporation or even if you can’t relate to either, the current trend in obesity in this country is affecting everyone. 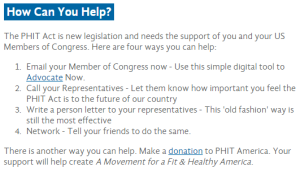 The PHIT Act will assist in adjusting behaviors and lifestyles that lead to being overweight and will reinforce the importance of being physically active throughout your entire life.